BDP‘s student housing scheme for Unite in Stratford, London has been given the go ahead by the Olympic Delivery Authority. 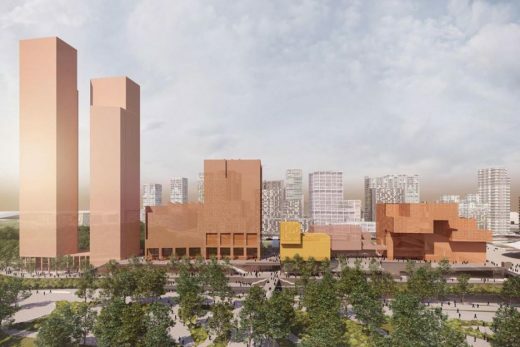 The project will be BDP’s tallest building at 28 storeys and it will be the first building to be completed on the Olympic Park post games in 2014. The site is at the end of Stratford City’s new boulevard and the building forms a highly visible gateway location in close proximity to the Olympic park and stadia, and the new international transport links. The building form is shaped in response to the immediate surroundings creating a home from home for students in a new city settlement. The tower is set around an internal courtyard, orientated to capture the best sunpath and provide a tranquil retreat from the urban environment. The project consists of 951 study bedrooms designed for a wide range of university students, from fresher to postgraduate. Accommodation is enhanced with common rooms, a series of terraces and a roof top conservatory inviting social interaction for groups of all sizes. The ground floor offers a welcoming reception area, storage for bicycles, a launderette, retail units at street level and a coach station. The building is designed to meet BREEAM ‘Excellent’ standards, as required by the brief. Features include storm water attenuation, provision of green roofs and the use of whole house ventilation with heat recovery, with a high level of insulation and air tightness. The entire heating and hot water load for the development will be provided by CHP which uses sustainable bio fuel.